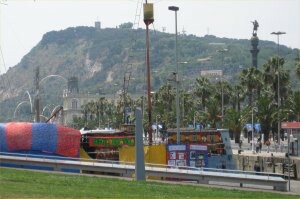 I am sat at Barcelona Airport at 12 lunchtime, and my flight doesn’t leave until after 10pm.I decide to get the bus into town, and do some sight seeing. 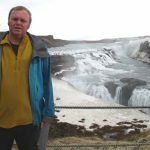 Is it possible to tour a whole city, in 5 hours ?. Armed with my DK eyewitness guide I set off to find out. 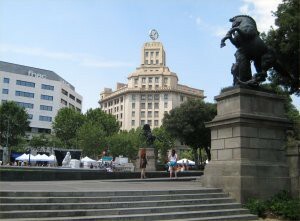 The bus (which takes only fifteen minutes to reach the city, and runs every 6 minutes 24 hours a day) arrives Plaça Catalunya, the central square in Barcelona.I wander further into the old town. 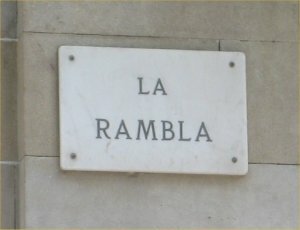 The most famous street in Spain. 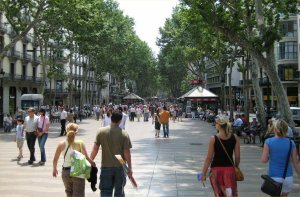 I walk down the Rambla.I really thought it was superb the way all the bars, cafe’s etc were centered around one place. I could see why so many “cultured” Stag and Hen Do’s are now held there. 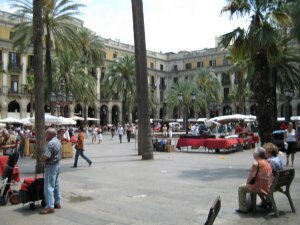 Placa Reial, Barcelona’s most lively square, just of the Rambla. 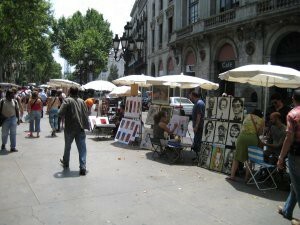 I continued down the Rambla, and saw lots of people selling souvenirs (but these weren’t tacky), offering to draw/paint pictures of me, a guy balancing footballs (he was up to 5 when I left) and various musicians. 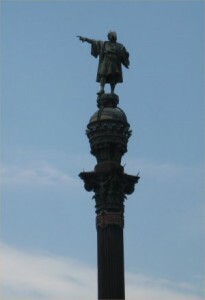 At the bottom of the Rambla, the Columbus Column. 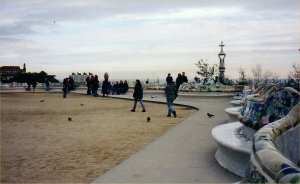 It is said to be positioned on the first spot that Christopher Columbus set foot back on land, after discovering America. It is inscribed with the word TIERRA, and shows him pointing. The basic idea, is it captures the moment he first set eyes on America. 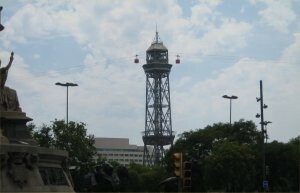 A tower for cable cars, connecting the waterfront and Montjuic. 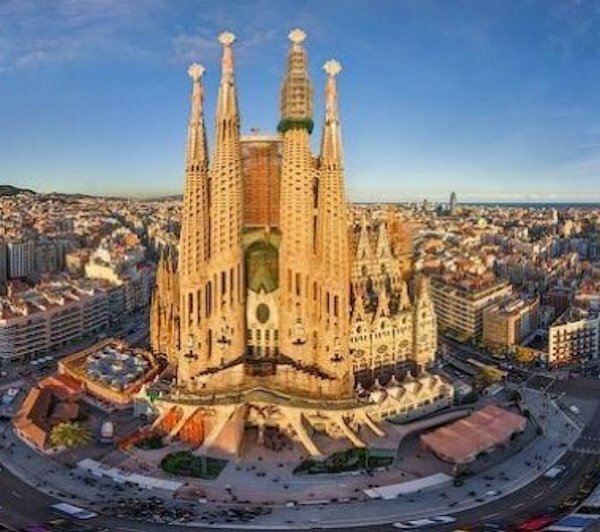 I really wanted to climb it, the views of the City are said to be spectacular, but time was scarce, and it just wasn’t possible to fit it into my itinerary. 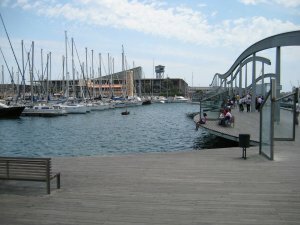 Rambla de Mar in Port Vell, at the bottom of the Rambla. 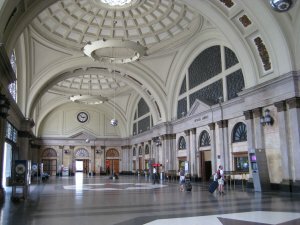 Rebuilt for the 1992 Olympics, Port Olympic is 2 miles long. 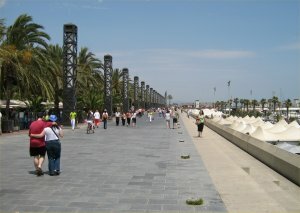 There were Palm tree’s running all the way along the see front, and people roller skating, cycling and walking dogs. It has beautiful Sandy beaches. 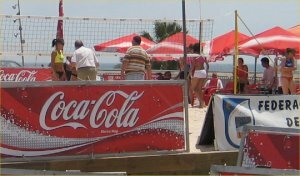 Considering its called Port Olympic, the only sport going on while I was there, was a volleyball competition, with a DJ playing really loud “euro” pop. 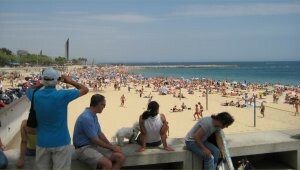 I was quite surprised at how many people had come out to sunbath. The Arts hotel and the Torre Mapfre, the 2 buildings on the water front, are both 44 stories high, and the highest in Spain. The one on the left is the Arts hotel, and the one on the right is the head office, of various companies. 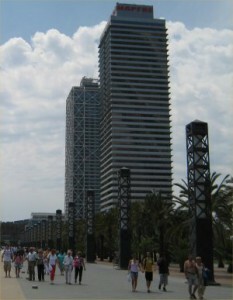 A civic building in Barceloneta. 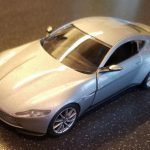 It was such a wild shape, I couldn’t help photographing it. 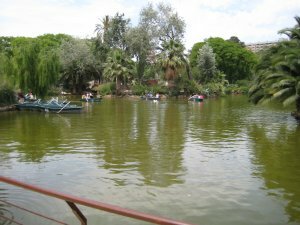 It was just about the best park boating lake I had ever seen. I really wished I had the time to hire one of the boats. 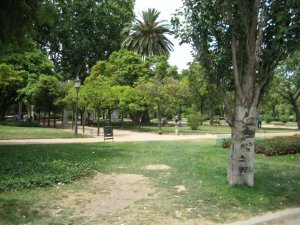 The Zoo on the Park grounds, is famous as it was the first to use moats to contain the animals, rather than cages so that they could be seen more easily, and would feel more at home. 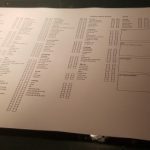 Inside, the menu was in 14 languages. 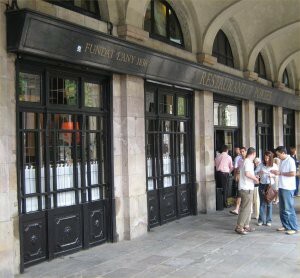 The staff were very suave, but you were aloud to go in, in fairly casual clothing. The decor and ambiance inside was like something out of James Bond. 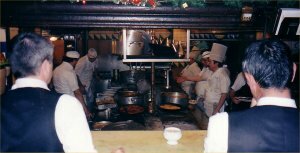 Inside an army of cooks, prepared superb food. 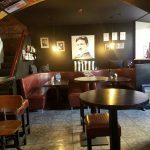 The waiting on staff, were impeccably polite and helpful. 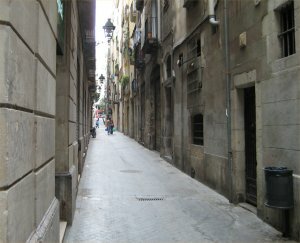 One of the small alleyways around Placa Reial. Very long and thin, I wouldn’t like to wander around here at night. Four Cats in Spanish means something of little importance. It was popular meeting place for Pablo Picasso, and the Stella Artious advert, where famous artists exchange panting’s for drinks, is said to have actually happened here. 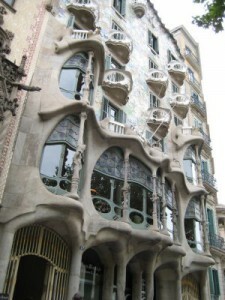 On the flight, I had read the guidebook, which talked about Architecture and Anton Gaudi. I wasn’t really impressed, as that’s not normally my thing. When I got there and actually saw some of the buildings, I couldn’t believe my eyes. This one is Casa Batllo. From the front it looks like the scales of a dragon. 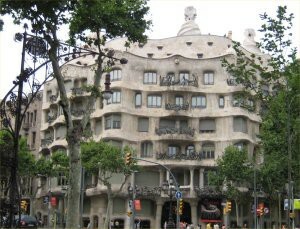 Its hard to explain, but the balconies and things are just stunning to look at. 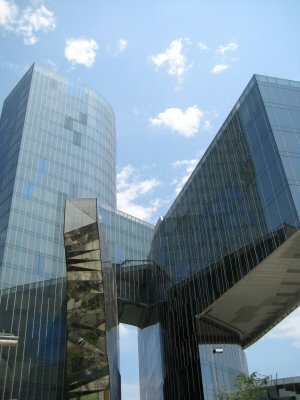 The building can be considered more of a sculpture than a regular building. 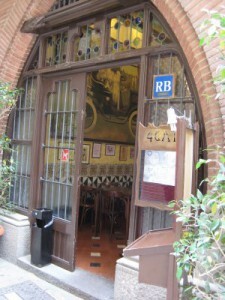 Barcelona has more Art Nouveau buildings than any other city in the world. 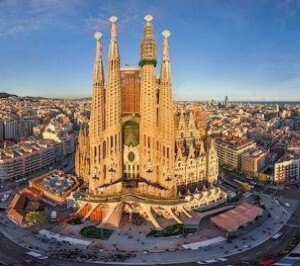 Sagrada Familia – The Guadi Cathedral. 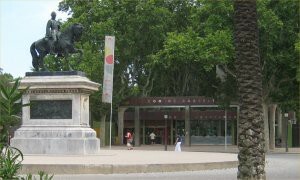 Unfortunately, he died before it was completed (he was hit by a tram and later died of his injuries). It’s said that he was so obsessed with this work, that he took up residence on the construction site. During the revolution, the rioters destroyed his working papers and models, so that it could never be completed (they did this, in their minds to honour him). 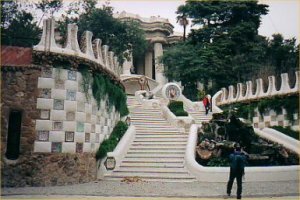 A terrace in the Park Guell, designed by Gaudi. 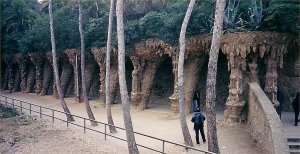 The twisting rock pillars that support the terrace above. The steps near the Dragon fountain. In summary, it was possible to see a place in 5 hours, but there was no time to relax or take anything in. I had been there before, but if I arrived in a different place I wanted to see, and I only had 5 hours, I would rather not see it, and come back when time was available.